Last night I went a little crazy and relived my veggie heavy days. (Aka, when I was a vegetarian). I had this beautiful zucchini sitting in the fridge and had been wondering what to make with it for the past couple days. Fresh from my parent’s garden and accompanied by ripe cherry tomatoes and fresh parsley, I was feeling the summer garden love a whole lot. Bonus today! I actually have two recipes that I felt ended up going together beautifully last night. There was my stuffed zucchini, which played the part of appetizer/side dish (in lieu of crispy bruschetta or garlic bread), and my main dish was a simple yet fresh and tasty pasta. I’ll skip the part where I talk and rumble a whole bunch and jump right into my recipes here. I’m not Italian, (contrary to popular belief), but I made one hell of meal to sway the general consensus in favour of the proud Nonnas and Nonnos last night. I love one pot meals. They’re creative yet easy and so delicious. I also despise post-cooking cleanup so this is the way to go on any lazy Friday night. 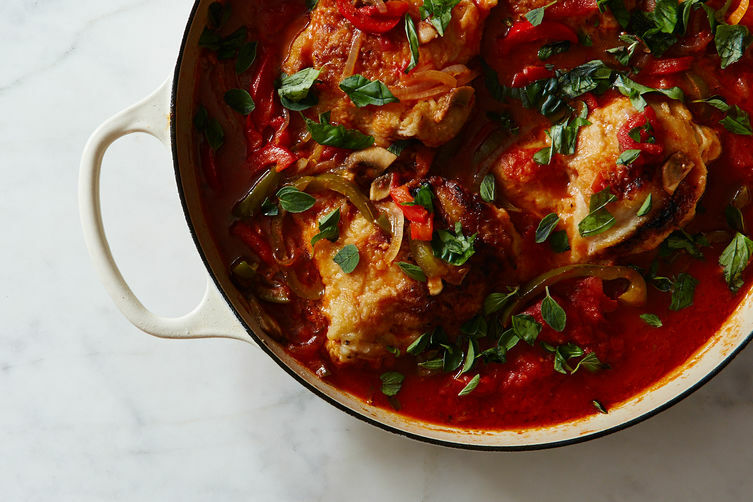 What is chicken cacciatore, you may ask? It’s a fancy way of saying chicken drowned in crushed tomatoes, any plethora of veggies and simmered down to a scalding Le Creuset pot of goodness. Now it all gets easy. You’ll want to dry your chicken with paper towels before even rolling them around in your swallow bowl of flour and salt mix. (I added a bit of garlic powder here, but that’s just because I love having breathe that could potentially save me under a vamp take-over). Did you know that if you don’t dry the chicken it won’t brown? Well, if you didn’t, now you do. Now toss in some butter into your medium-large cooking pot and allow to melt down and warm before adding your chicken. It normally takes 4-6 minutes of cooking on each side of chicken thighs for them to cook through. Once your home smells wonderfully of browned chicken and butter, remove your chicken and place aside. Drain out the fat from your pot and add a touch more butter or olive oil. Toss in your onion and mushrooms and allow to brown. (If you crowd the mushrooms, browning will take longer). Then add your garlic, celery, pepper and carrot to the mix. Let simmer in their own juices for about 8 minutes. Pour in your tomato sauce (or diced tomatoes) and the chicken broth. Stir, picking up the vegetables from the bottom of the pot to combine all flavours. Using tongs, place your chicken back into the pot to gently poach and marinate in your saucy creation. Leave simmering for 20 minutes. Let cool, and maybe serve on a bed of rice, and enjoy!